We’re kicking off another year of Hempfest Membership gatherings with 420Fest presented by Secrets of the River. Join us as we gather in celebration for the progress that has been made in legalization and discuss in community where things should go next! Membership is one of our largest fundraisers and helps build community too! We are a C4 non-profit organization educating the public on the myriad applications of the cannabis plant, the laws about its use, efforts for reform, and conducting business in the new legal environment. 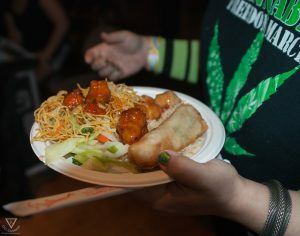 There will be food, music, entertainment, & the usual Hempfest merriment! We will be holding a raffle to benefit Jimmy Romans whose life sentence for cannabis was recently reduced to 30 years. Why are people still in prison for pot anyway? Become a Member! Support Hempfest, network within the cannabis community, support Jimmy Romans, and have a great time while doing it! Cut the line! Use the Member’s entrance at the Seattle Hempfest festival. Bring an entourage – level dependent, but you can bring friends too! Get a Membership card & Membership shirt – level dependant. Network with other Members at our Member’s only events that take place about four times per year. That warm fuzzy feeling you get when you support something you believe in! Full info about Membership is HERE. You may purchase your Membership Online, at Hempfest Central, or at the door of 420Fest.